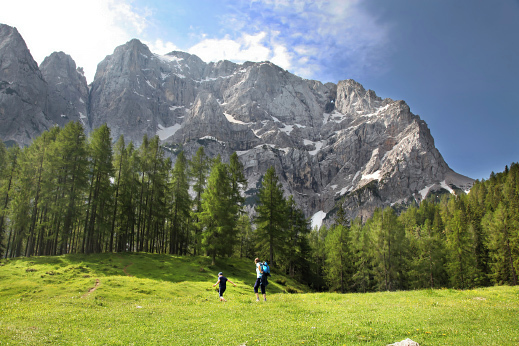 Hiking is not only a favorite pastime in Slovenia. It’s a tradition. Deeply ingrained in our culture, we fondly joke we even carry it in our DNA. 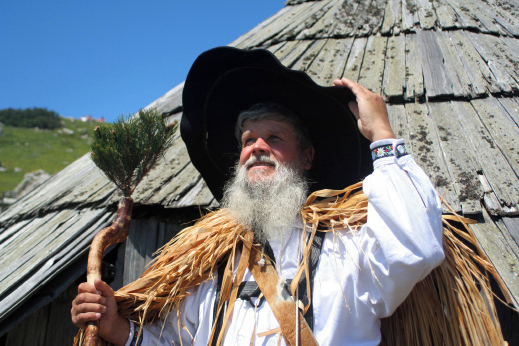 There’s even a saying, that you’re not a true Slovene, until you conquer Mt. Triglav, which is at 2864 m (9396 ft) our highest mountain. Its name means Three-headed and is also a beloved symbol, which adorns our national flag. Weekend escapes are therefore most commonly connected with the question: Which trail are we hiking today? On a sunny Sunday you will see many of us – from the dedicated hikers to families – putting on our hiking boots and hitting one of the many trails in our green heart of Europe. Here one can find trails of diverse characteristics and various themes, connecting mountain peaks and valleys with coastal areas. First one on the list is the Slovenian Mountain Trail, which was the first connective mountain trail in the world. It spans over a length of about 600 km (370 mi) through most beautiful parts of the country. You might have also heard of the Alpe Adria Trail, which connects Mt. Grossglockner in Austria with the Adriatic sea through our mountains and valleys. Or maybe the Walk of Peace, which follows the battlefields of World War I, taking you through outdoor museums and memorials, which also crosses our emerald beauty, river Soča. 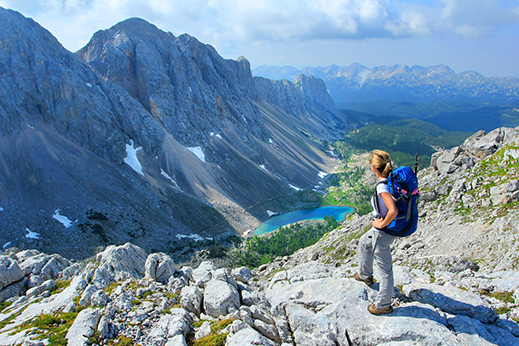 In the summertime there are many hiking events, dedicated to some of the trails. Quite a few of them are connecting various regions and showing you the vast diversity we have on such a small place – don’t forget that Slovenia is covering a really tiny part of Europe, covering only 20,273 square km. But that tiny part sits right at the juncture of different geographic and climatic regions. From Alps to Mediterranean or towards Panonian plain. Flats or hills, rivers or lakes. Rugged mountain scenery, delicate alpine flowers and lush forests. Stop to taste some of the world most delicious wines, overlooking stunning scenery of vineyards and fragrant cherry blossoms of Goriska Brda (Collio), one of the many wine-making regions in the country. Finish your day with a fine Italian espresso on a square overlooking the Adriatic Sea. If your schedule is tight, you could even do all of the above in a day – the diversity of nature is one of our most beloved characteristic of the country. Fairy-tale scenery is never too far in this outdoor lover paradise. The Valley of the Triglav Lakes is an Alpine glacial valley. It is situated at the center of The Triglav National Park, which is one of the oldest European parks. The first protection dates back to 1924 when the Alpine Conservation Park was founded. Often referred to as The Seven Lakes Valley, even though there are actually more than seven lakes. The number of the lakes is connected with our oral literature, and not with the actual number itself. The legends are still alive in this lovely alpine scenery…have you heard about Zlatorog, an ibex with golden horns? The Valley boasts an interesting flora and fauna, fossils and Alpine animals. Colorful flowers and turquoise lakes among the rugged mountain landscape is true fairy-tale scenery. There are trails from all sides approaching the valley – from easy to moderate or challenging – choose your level and leave the rest to us! Triglav lakes valley is also part of our Hut to hut tour. Nicknamed “The emerald beauty” – Soca river is considered as one of the most beautiful rivers in the world. “You are splendid, daughter of the heights.”, wrote our beloved poet Simon Gregorčič in a poem, that was dedicated to the river. And it is – the colors seem unreal and its temperature cools us on the hikes along the stream. 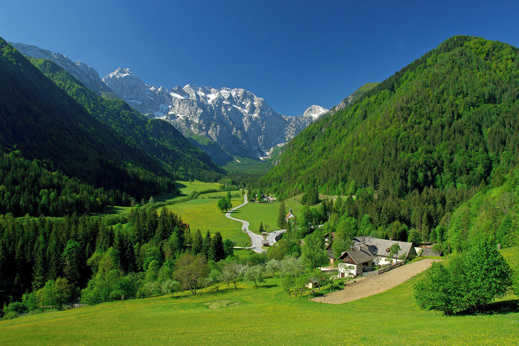 Also part of The Triglav National Park and the famous Alpe Adria trail. The full length is 25 km (15mi) and we have selected its best parts on our tours. It is part of all of our itineraries in Slovenia. Vršič pass (name meaning Little peak) is with its 1,611 m (5,285 ft) the highest mountain pass in Slovenia. Many bypass the highest point only with a quick stopover for a photo of the views. But the pass is an excellent starting point for many of the hikes to surrounding peaks. 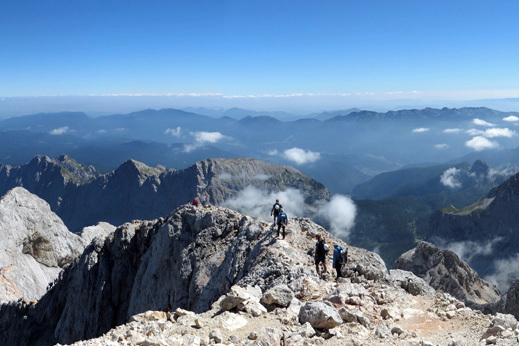 Our favorite hike leads towards Slemenova Špica (name meaning Ridge’s spike), which is one of the most photographed panoramic points in Julian Alps. A 360o angle view is magnificent and can be reached within 1’5 hrs. Part of our Hiking Highlights itinerary. On the other side of the road, a short walk will take you to the viewpoint of The Pagan Girl, a rock formation that resembles a female human face. Over there you will find an old path, named ‘mulatjera’ (the name deriving from the fact, that it was used for mule transport). This scenic road is great for bike trips, so don’t miss it on our Mountain Bike Heaven. Arriving to the Big Pasture Plateau feels like a step back in time. Green meadows dotted with shepherds huts is a true cow’s paradise. Measuring about 1070 ha, the plateau represents the largest Slovenian mountain pasture. Mountain pasturing in Slovenia is primarily linked to the Alps. For the last few hundred years the shepherds tradition was to move in summer months to the mountains to avoid buying fodder for their cattle in the valley. The typical architecture of the cottages is still preserved and while visiting those are the places where you can find fresh dairy products. Be sure to taste typical herdsmen’s meal – sour milk and buckwheat mush. Located at the foothills of Kamnik – Savinja Alps, the Logar valley is considered as one of the most beautiful Alpine glacial valleys in Europe. If you’d like to experience the serene, peaceful beauty of the Alps without all the crowds, this would be your best choice. Here you will find harmony between nature, tradition and serenity. Lots of options, to discover the valley by bike or on foot. Details coming soon.